Sicily, the island of plenty! Apart from Veneto, the region I live in, Sicily is the part of Italy I have spent the most time in. My husband is Sicilian and of course we have paid many visits to his family there. 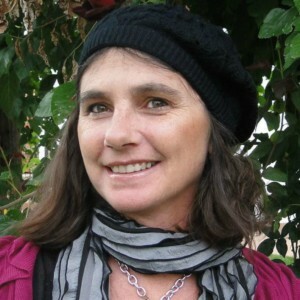 However, even before I met my husband and moved to Italy, I had visited Sicily many times. Yet, despite my numerous trips, there is much of this beautiful island I do not know and long to explore! Sicily is a large triangular island lying just off the tip of the toe of the Italian boot-shaped peninsula. 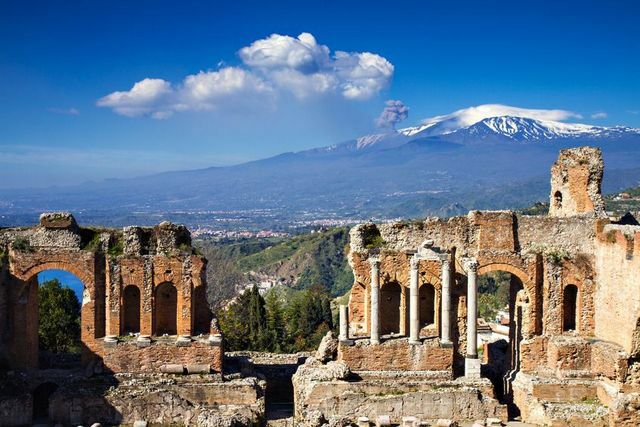 It’s a mountainous island and home to Europe’s largest active volcano, Etna. I’ve seen larva flowing down Etna’s slopes a number of times, obviously from a safe distance! Although many would quite rightly think it’s crazy to live under an active volcano the lower slopes of Etna are dotted with numerous villages and farms, because the volcanic soil is very fertile and the harvests plentiful. The island is well known for its citrus fruits, (the most famous of which are the tarocco blood oranges) its almonds, tomatoes, pistachios, honey, egg plants, olives, olive oil and, of course, grapes. 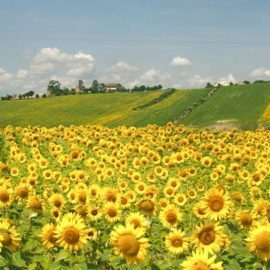 It is the third largest wine producing region in Italy. In addition, a lot of cheese and local sausages and salamis are also produced there. Of course, being an island means fishing is an important industry and the Sicilian fish markets are a delight for foodies and chefs! 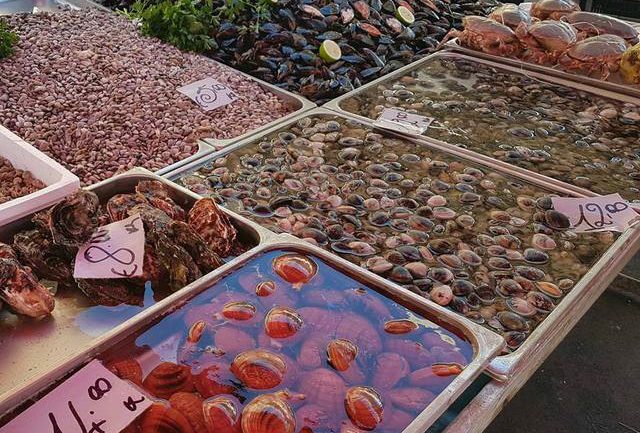 In my opinion, Sicily has the greatest variety of freshly caught seafood I have ever seen in Europe and needless to say seafood is very prominent in the local cuisine, not only as a main course but also in antipasti (appetizers) and on pasta. The island’s coastal restaurants serve some amazing seafood dishes. In the hinterland, meat plays a more prominent role with lamb, goat, veal, sausages and salamis being the most traditional meat specialities. 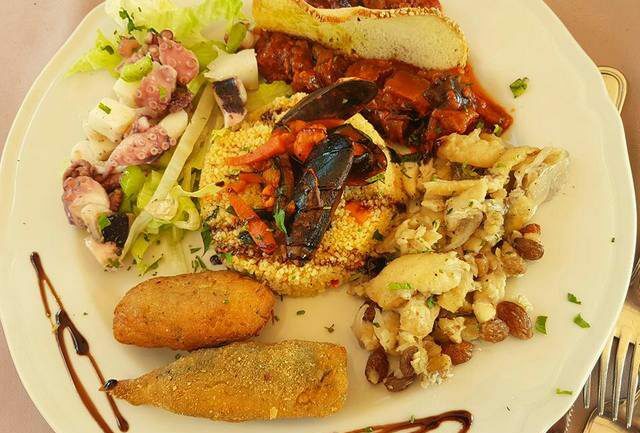 Although Siciilian cuisine is essentially Italian, there are notable differences resulting from the influence of the different cultures which settled on the island in the past. The Arabs, the Spanish and the Greeks all left their mark on the Sicilian kitchen. For example, couscous is a staple in Western Sicily. When it comes to pasta the Sicilians eat mostly dry pasta and their favourite appears to be short tubular pasta such as penne or long strand pasta like bucatini or spaghetti. The latter is not surprising when you consider that many believe dried spaghetti originated in Sicily. 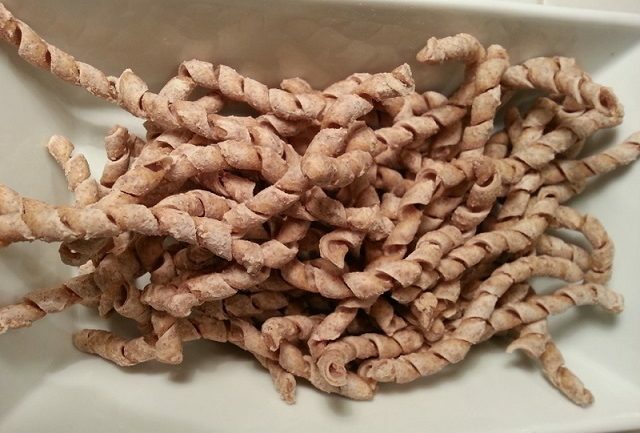 There are various versions of the history of this world famous pasta but, according to historians, it was the Arabs who showed the Sicilians how to dry pasta in the 8th century. By some time between 1000 and 1100 AD, the Sicilians were producing long strand pasta in quantities great enough for it to be exported to other regions. A manuscript called the Book of Roger, which was completed in 1154, describes a large-scale operation of what appears to be spaghetti manufacturing in the Sicilian town of Trabia, near Palermo. One of the oldest known words for pasta is ‘maccarunne’ from the Sicilian word ‘maccare’ meaning to crush the grains to make flour. 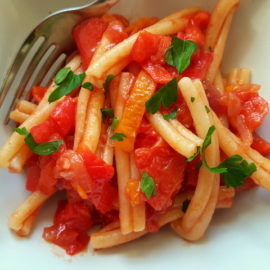 There are also some typically Sicilian pastas that aren’t eaten here in the North where I live. 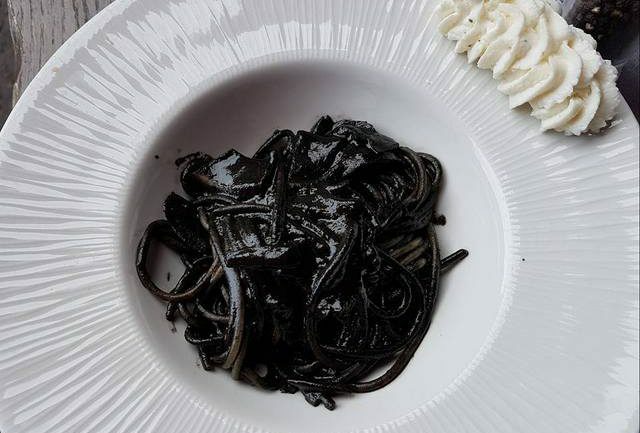 One example that comes to mind is busiate, a pasta that looks like telephone wire and is eaten mostly in the Trapani area. 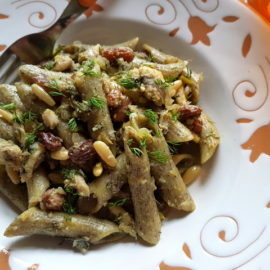 Pasta con Sarde (pasta with sardines) is one of the oldest pasta dishes in Sicilian cuisine. Legend has it that when Euphemius of Messina returned from exile in Tunisia to mount a military expedition in 827, his Arab cooks,ingeniously put together a pasta dish with the first ingredients that came to hand on landing at the harbour of Mazara. The dish they created was made with fresh sardines, wild fennel, raisons, saffron and pine nuts.This dish has been eaten in Sicily ever since. There are, of course, modern variations which can include breadcrumbs and white wine! 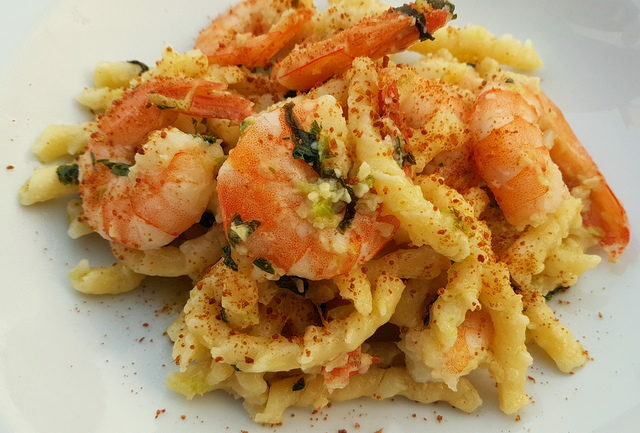 Busiate pasta with bottarga and prawns. Other popular typical pasta dishes on this largest of Mediterraenean islands are spaghetti or bucatini with bottarga (tuna fish roe), with anchovies and breadcrumbs, with prawns in fresh tomato sauce,with sea urchins (Yes sea urchins!) and with cuttle fish ink (yes,cuttle fish ink which produces a very black sauce!). Sicilians also make different types of pesto, such as pesto Trapanese which includes tomatoes and almonds or pistachio pesto. 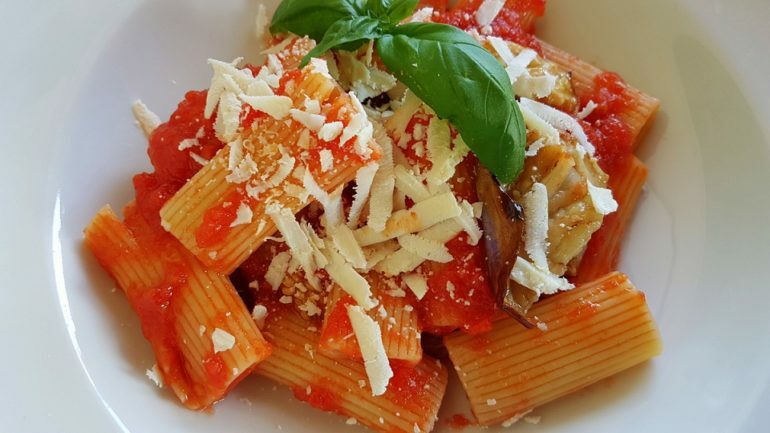 Of course, Sicilians don’t just eat long strand pasta there are also a number of traditional dishes with other types of pasta shapes such as cavatelli with egg plant, penne with sausages and cream and various types of ‘timballo’ which are like pasta pies. My Sicilian hubby makes a fabulous baked anelletti timballo, which is so yummy! I guess the most famous pasta dish, although not as old as pasta with sardines, is pasta alla Norma. This homage to one of Sicily’s most famous sons is usually made with egg plants, tomatoes and ricotta salata (a salted ricotta cheese). The composer Bellini was born in Catania and according to legend this pasta dish was named to mark the occasion of his opera Norma opening at the city’s brand new opera house in 1890. 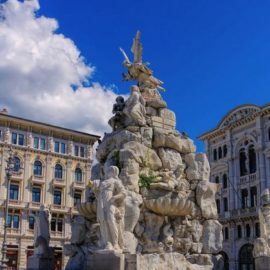 Even Italians from other regions appreciate the food in Sicily and many travel south to sample the gastronomic delights this region has to offer. Many would say that Sicily has it all..climate, beaches, history, food and wine. They are right!